I started making Christmas ornaments for gifts about 27 years ago. Since then I make about 35 of each ornament per year for friends and family. 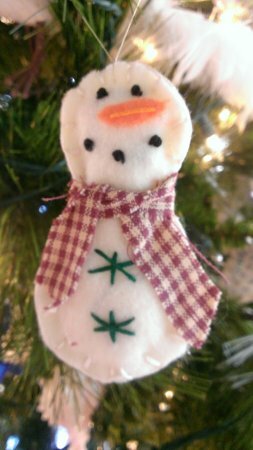 Start by cutting out 2 felt snowman shapes. Crisscross green thread to make 2 buttons. Cut out a small piece of orange felt for a nose, then sewed it on with orange thread. Sew black French knots for eyes and a mouth with black thread. Blanket-stitch around the outside with cream colored thread. Before closing the opening I stuffed cotton balls inside then finished stitching the 2 pieces closed. Cut a piece of fabric and tie around neck for a scarf. Run a string of thread through the top for a hanger.